US-301 S/50 W. Go over Bay Bridge. Stay on 50 West. Take exit 23B for MD-450 toward Crownsville. Keep right at the fork . Right onto MD-450 E/West Street. Take the 1st right onto Riva Road. Destination will be on your left, inside the Nationwide office. 2521 Riva Road, Suite 3. US-50 E. Entering Maryland. Take exit 22 for Maryland 665 toward Aris T. Allen Blvd/Riva Road. Keep right at the fork to stay on Exit 22, follow signs for Maryland 665 E/Riva Road and merge onto MD-665 E. Take the Riva Rd exit. 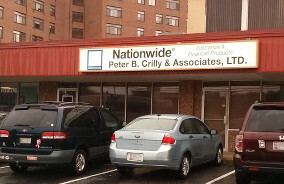 Left onto Riva Road N. Destination will be on your immediate right, inside the Nationwide office. 2521 Riva Road, Suite 3.